FarmVille will soon be releasing this new building pen that can create new and rare deers. 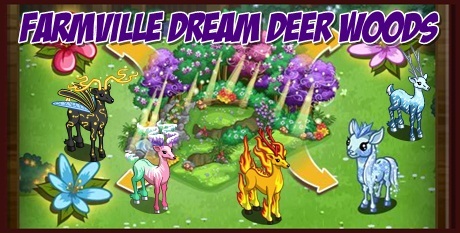 The FarmVille Dream Deer Woods will be like the previous animal laboratories where players will be tending the building to obtain parts. These parts can then be used to create deer. For this version, harvesting the Dream Dear Woods will give Wildflowers. There will be a total of 5 different colors of Wild flower. The rarer color can only be obtain from rare deer. Also it may also give random adorable baby fawn when harvested. Tip: Building multiple pens or Dream Deer Woods pen will make collecting Wildflowers less hard. If possible build a pen for each color of Wildflowers and placed solo the deer that produces that color so that you can specifically harvest that particular color you need.